1 of 3 Heat oven to 425 degrees F. Roll and stretch dough into a large rimmed baking sheet, at least 15 x 10 x 1 inches. Sprinkle with Parmesan cheese and bake at 425 degrees F for 14 minutes or until lightly browned. Remove from oven and set aside. Reduce oven temperature to 325 degrees F.
2 of 3 While dough is baking, toss together tomatoes, shallot, garlic, vinegar, salt and pepper in a medium-size bowl. Spread tomatoes in an even layer in a rimmed baking sheet and roast at 325 degrees F for 30 minutes. Remove from oven and gently stir in arugula. 3 of 3 Sprinkle 1 cup of the mozzarella over dough and scatter tomato mixture over top using a slotted spoon. 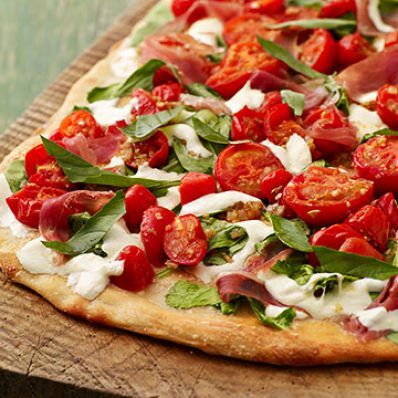 Distribute prosciutto slices over tomatoes. Sprinkle remaining mozzarella over top and bake at 325 degrees F for 15 minutes. Cool on wire rack 5 minutes, then sprinkle with basil. Per Serving: 5 g sat. fat, 772 mg sodium, 2 g fiber, 10 g Fat, total, 35 g carb., 15 g pro., 293 kcal cal., 28 mg chol.